Kiwi is a Berkeley based “food delivery” startup that offers delivery op- tions from the popular nearby restaurants, and then delivers them to user through an automated vehicle, which can be unlocked by the user to collect the food items. In just about a year, Kiwi seems to have made a decent amount of tie-ups with the local restaurants, and seems to gathering steam in the Berkeley area quickly. There’s no doubt though, that the real crowd puller for kiwi is the Bot that’s currently trotting the sidewalks of Berkeley. A bright blue flag hangs on the petit bot to make the vehicle noticeable to the people walking on the street. The bot moves cautiously, looking twice before crossing a street. It’s a pleasant looking design which seems as though it was internally designed, as opposed to getting an off-the shelf vehicle. For some reason, Bay Area’s budding entrepreneurs in the food sector seem to be obsessed with removing human interaction between the restaurant and its customer. 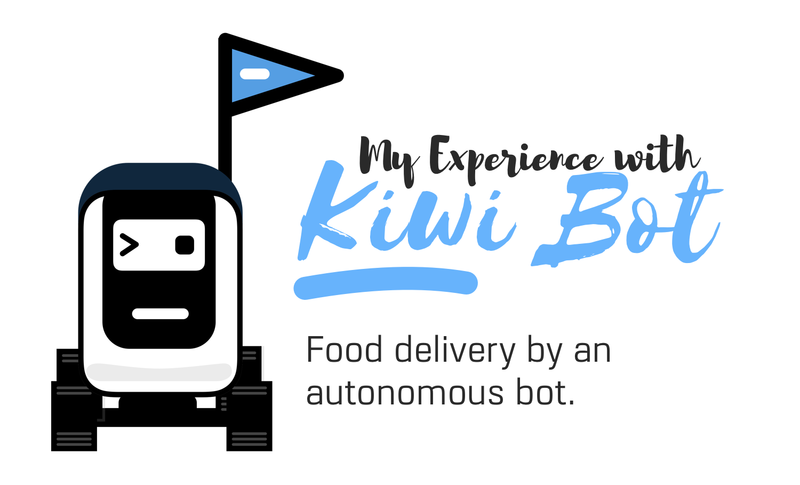 Last year it was food being put in lockers for customers to collect, by Eatsa , this year it’s Kiwibot which aims to replace delivery boys with delivery bots. Dominos has had something similar in the US for a few months now, but this is the first time that I witnessed it, and it definite- ly caught my attention. So I decided to give the app and the experience a try. The onboarding process for Kiwi; Do we really need these screens at this point in the user flow? I think some of the permis- sions could be asked for at a later time. Straight up, the onboarding experience isn’t very appealing. It’s just a bunch of screenshots that inform the users about the permissions they must give in order to use the app effectively. Personally I found that the app didn’t really need those permissions on first launch, you can ask me to give a permission for notifications when I place the order, my location information can be asked for when I’m looking for restaurants. The images on display weren’t optimised for iPhone X either, I could see text being cut off by the margins, but that seems like a problem which can be fixed with a minor update. The bigger problem is the fact that, the first launch screen exists in the first place, I’d personally do away with it, or talk about the product on that screen instead of prematurely asking permissions. The layout for selecting the restaurant is pretty simple. There’s just a list of avail- able restaurants and pressing one of them leads you to another simple list of menu items, you can customise them if that’s possible for the particular item (for example you’ll need to customise a burrito from Chipotle). The flow works fine if you’re not customising your order. If you are customising the order it gets con- fusing very quickly, moving back from the customisation screen actually cancels your order, and you need to start again, however if on the customisation screen, you tap the add button, it actually takes you back to the order screen but this time with the order quantity selection element on the screen, after which you can confirm and setup the payment and address information. It’s also surprising that the app doesn’t use a lot of system elements. For example there’s no auto fill for credit card information, so you need to input the card details manually. Once the order is placed the app should show you a map with the position of the bot (which didn’t work for me during this particular order but I suppose it was a one off bug); The screen also features an unlock button which gets activated once the bot reaches the location. While the ordering experience wasn’t great, I managed to place the order without much of a hitch. The receiving part was also pretty much seamless. I just had to press the unlock button in the app and the bot opened to show the food item neatly placed in the buggy that also serves as a hot-box. It seems as though Kiwi has spent quite a bit of time perfecting the delivery vehicle. And the app’s improving quickly. In the month since I’ve used Kiwi there seem to be minor improvements already. It’s good to know that the creators are tak- ing feedback seriously. But is it really better than having your food delivered by a human being? I don’t think so. Once the novelty of a cute robot delivering your food dies off, the only scenario where this may be feasible is is when its hard to find people to de- liver food items, or there’s an economic benefit for the restaurant to have your food delivered by a bot. While it was fun to see my order delivered by a robot, I wonder if it’s something that popularises any time soon. The user flow for ordering a customised meal with Kiwi. While it’s better to have a bare-bones approach to the process than to offer fancy animations for no reason, sometimes even the simplest of interactions can become confusing. In this case it was the app going ‘back’ to the previous screen after pressing “add” that lead me to believe that if I were to do the same, it’ll still retain my order information. It didn’t and I had to start over.